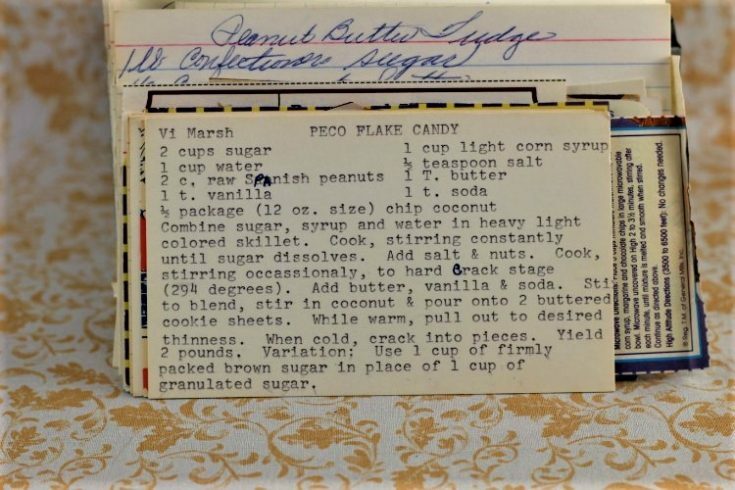 Front of the recipe card for Peco Flake Candy. There is a notation that the recipe is from Vi Marsh, who at this time I do not know who she is. 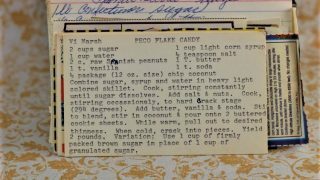 There are lots of fun recipes to read in the box this recipe for Peco Flake Candy was with. Use the links below to view other recipes similar to this Peco Flake Candy recipe. If you make this Peco Flake Candy recipe, please share your photos and comments below! Combine sugar, syrup and water in heavy light colored skillet. Cook, stirring constantly unstil sugar dissolves. Cook, stirring occasionaly, to hard crack stage (294 degrees). Add butter, vanilla & soda. Stir to blend, stir in coconut & pour onto 2 buttered cookie sheets. While warm, pull out to desired thinness. When cold, crack into pieces. Variation; Use 1 cup of firmly packed brown sugar in place of 1 cup of granulated sugar.